The torrential downpours have kept me from photographing anything in the garden lately. So I can only offer a couple of pics of some blooming plants from last week for Garden Bloggers' Bloom Day hosted by Carol at May Dreams Garden. Go to her link to see what's blooming around the world today. When we get the occasional sunlight, we get the occasional butterflies. At top is a Gulf Frittilary on Buddleia davidii 'Pink Delight' (butterfly bush). So I guess the butterfly bush is doing its job finally! The Tagetes lucida (Mexican mint marigold) is finally blooming in front of the Salvia leucantha (Mexican bush sage) and the rosemary. And on top of the bloom, one of my new favorite butterflies, the Pearl Crescent. They're not very big but they're awfully cute to me. Looking out the rain streaked window, trying to ignore the plants that are now leaning on their neighbors or heads down in the dirt from the rain, I see other bloomers like 'Autumn Joy' sedum, Moonflower (though it only blooms at night), Pink Muhly grasses, ‘Whirling Butterflies’ gaura, very few blooms on the Madame Alfred Carriere and mystery red roses (normally October's a great month for roses here), garlic chives, Salvia 'Coral Nymph', 'Patrick's Abutilon', and Verbena bonariensis. We've gotten about 12 inches of rain in the first two weeks of this month. And a bit more than that in the last two weeks of September. So things are really not looking their best right now. Not enough sun and too much water. Normally October's a glorious month here. Ah well. At least I'm safe and dry! These photos are gorgeous! Sorry about so much rain...at least you are safe and dry!! A season for everything..
Gulf Frits and their little cousins are the only butterflies left here,too, except for the Sulphurs who manage to come out on any sunny day year around. Salvia leucantha is just a delight this time of year. It's hard not to fondle those velvety blooms. Love it with the yellow/gold/orange. It hasn't rained here in month's so color me jealous! My mom (in North Carolina) said it's been raining there for days, so she's rubbing it in even more. LOL! But of course, if it rained that much here, we'd all freak out first that all the plants are too water logged, then we'd freak out over the flooding. I suppose I should pick my battles! 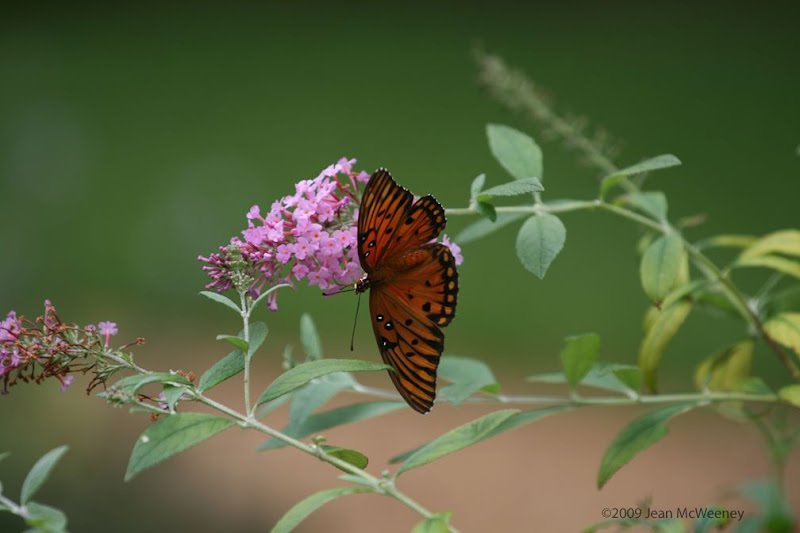 I love the butterfly on the butterfly bush, how aptly named! It's so fun catching the little critters at work. The first picture takes me to a fairyland. It's just gorgeous! Print it and frame it. The butterflies add just the right touch to the blooms. How delightful it must be to see them. I'll have to wait until next summer to see a butterfly. Jean, your title could fit many of our posts today:) I would love to see just a few rays of sunshine one of these days. Your photos are gorgeous, nevertheless, and it's great to see these lovely butterflies; all of ours have gone south for the winter. BTW, I left a comment on your last post--fantastic post! Safe and dry....that's a good way to look at all the rain you've been having. An occasional butterfly is better than no butterfly. We are "butterflyless" this time of year. I'm always impressed by your butterfly pictures - how do you do it? I've only ever managed to catch one which obligingly stayed still long enough. Lovely. Ruth - I guess my only trick is that there are enough butterfly friendly plants in one place to where they don't go very far if I miss the shot. So I just hang around and eventually one will be in the right place at the right time! Just beautiful and I do love Mexican sage. I have planted a lot of Verbena bonariensis but it didn't come up well. I think I put too much mulch down. Got to remember to lay the seed after I mulch. Next year, I am going to have to plant some Mexican mint marigolds next to my Mexican bush sage. I love your combination. Something about the Soggy Blogger title made an image of George Clooney in O Brother pop into my head, Jean. We want and need the rain, but also want to be in charge of the schedule. 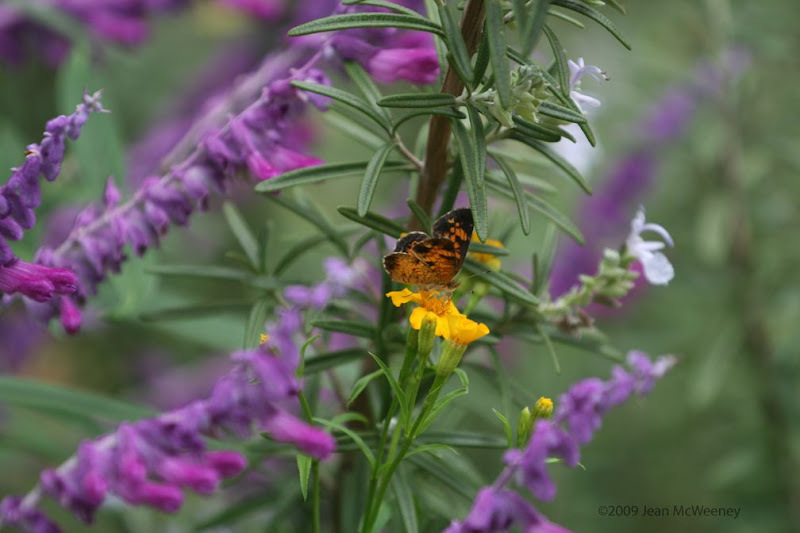 Your photos are beautiful- hope the butterflies stick around for awhile! I loved looking at your butterflies. We see the Pearl Crescent here often but never the Gulf Frittilary. I wish I could grow buddleia but the Japanese beetles just chew it up and leave nothing for the butterflies. Looks like October has been bad for a lot of us, not just those in the north, who expect it. Love that sage.A lot of Southern gardeners seem to have it. Those photographs of butterflies are just spectacular. I wish I had the secret to butterfly photography. They seem to be scared of me! I love all your butterfly pictures, they are keeping me happy while looking at the snow. For your photography skills, I have bestowed upon you the "Honest Scrap Award" at my Gardening for Nature blog.